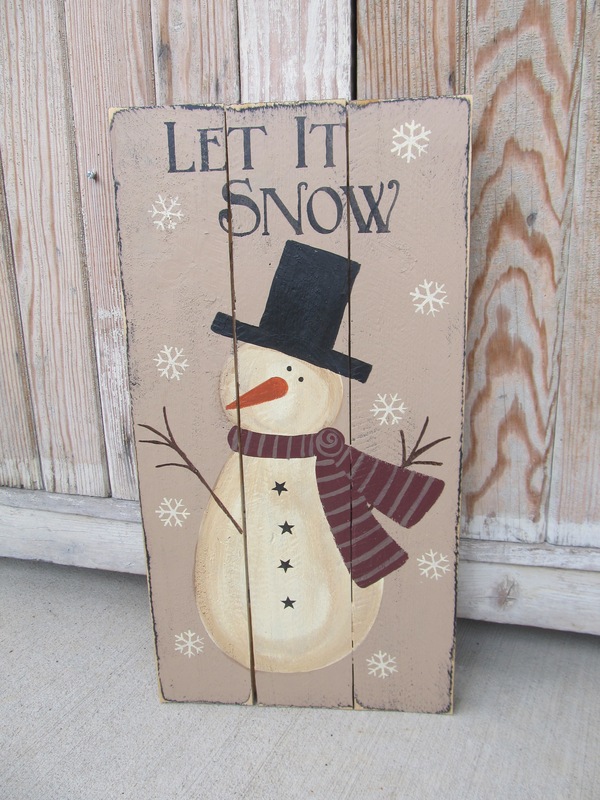 Primitive Hand Painted Let it Snow Snowman Pallet Sign. Featured in the November 2017 Issue of the Country Sampler Magazine. I love painting on these new pallet signs. This one is perfect for all winter long. Hand painted snowman with top hat and burgundy scarf. The background color is khaki tan that's been distressed. Let it Snow was stenciled on as well as snowflakes falling all around. He has painted on star buttons as well! Choice of scarf color for the snowman and hanging option. Size is 20" x 10 1/2" . Hand painted, designed and signed by Heidi.